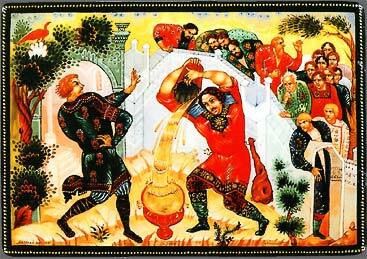 In the rich trading city of Novgorod lived Buslay, a rich man who lived an honourable and peaceful life. When he was 90 his wife Amelfa Timofeyevna bore him a son whom he named Vasili. The father died before the boy was seven years old. The mother had her son taught by a master to read, write, and sing very well, but when he weas 12 years old Vasili had had enough of education, and developed to become Novgorod's strongest and cruel street-fighter. Furious citizens regularly came to visit his mother. She urged him to assemble a band of soldiers to fight the unbelievers as his father had done, instead of doing evil. Vasili interpreted his mother's advice in his own way. He wrote down on strips of paper: "Anyone who wishes to eat and drink as much as he likes, come to me. Vasili Buslayev." He folded the strips of papers into arrows and shot them into the town. Then he took a large number of barrels of wine from his father's stores, filled up a beaker with the contents of a bucket and a half, and placed it outside. It did not take long for the guests to arrive. Vasili took hold of a club weighing 12 pud and said: "Anyone who can lift this beaker with one hand, drain it in one gulp, and withstand a blow of my club on his head without falling over can be my friend and may come in to celebrate with me." Everyone left discouraged, except for the latecomer Kostya Novotorzianien who managed to lift the beaker with one hand, drained it in one gulp, repeated this once again, and bore Vasili's blow on his head without falling over, merely saying: "I will just empty a third beaker." The two lads entered the house and made friends. Then, through the window, they saw Potanya the Cripple approaching. He also achieved and endured what Kostya had achieved and endured. The next few days another 27 strong lads achieved and endured the same. Celebrating day after day, they formed Vasili's band of men. The hero continued to feed and clothe them generously. The people of Novgorod wondered where it would all lead. During a meeting about this matter, a stranger struck his staff on the ground three times and suggested: "Let us too give a feast and not invite Vasili and his band." Of course, he and his followers will come anyway. Then we will offer the leader a flagon of green wine with the words: "Anyone who is a friend of Great Novgorod, drain this flagon. If he accepts it, he obviously has no evil intentions towards us. If he refuses it, we should watch out." They all agreed, and a great feast was prepared. Vasili and his band arrived uninvited, exactly as the stranger had predicted. The aggressive young fighter was offered a flagon of green wine with the words "For anyone who is a friend of the city." Vasili accepted the beaker and called out, "Long live Novgorod." He drank the wine in a single gulp, and everyone was relieved. However, befuddled by the alcohol, he became aggressive later in the evening and threatened: "Whatever you do, you are, and will always be fools. You will all be in my power and pay tribute to me." The furious citizens doubted this. Then Vasili suggested holding a duel on the bridge over the Volchov between him and his band, on the one side, and an army of townspeople, on the other. If the latter won, they could take his head, but if he won, everything and everyone in Novgorod would belong to him. The drunken Vasili went home and boasted about this bet to his mother. He predicted: "Tomorrow will prove to all those unbelievers in Novgorod that Vasili Buslayev is the boss over everyone." His mother locked him up. The next morning Vasili's band awaited their leader in vain, and then decided to fight the townspeople without him anyway. The band was heavily outnumbered and in danger of losing, but Amelfa Timofeyevna's housekeeper, who was doing the washing in the Volchov, saw what was happening to the band. She ran back home and freed Vasili from his bedroom. Hastily the hulk grabbed the axle of a cart, ran to the bridge over the Volchov and defeated the army of Novgorod. He went berserk to such an extent that his godfather, the kalika Ondronich Piligrimitch was called from the Cyrille abbey nearby to negotiate. Perhaps Vasili would sign a peace treaty in return for a dish of pearls, a dish of silver, and a dish of gold. The monk was refused. Finally Vasili's mother was called and she persuaded her son to accept peace. Novgorod accepted Vasili Buslayev as mayor. Travelling down the great rivers of Russia, Vasili and his band subjugated the Finns, the Mongols and most of the people around the Caspian Sea. They returned after a victorious campaign lasting many years. With Kostya Novotorzianien at the rudder, and Potanya and Foma at the bows, their ship entered the port of Novgorod via Lake Ilmen and the Volchov. Vasili looked grave. He set foot on land and went straight to his old mother. He wished to do penance for all his former violent acts, even if they sometimes served a good purpose. He announced: "My next trip will first lead to the grave of the Lord and then to the Jordan to cleanse me of all my sins. 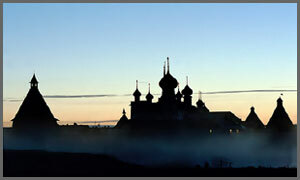 Finally I will climb Mount Tabor to gain an insight into what must happen both to me and to Novgorod." Obviously Amelfa Timofeyevna gave her blessing for this excellent plan. She even predicted that the earth would no longer tolerate her son if he continued to plunder and murder. 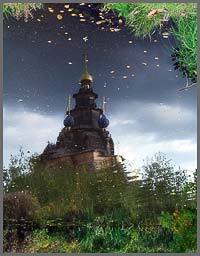 The next day Vasili and his band sailed away from the port of Novgorod to Jerusalem. For a month they saw no one, for everyone fled from them. Then sails appeared on the horizon; they appeared to belong to a pair of trading ships. Vasili sailed alongside and informed the frightened merchants that he was no longer a robber. Could they show him the shortest route to Jerusalem? The merchants pointed out that there was a route across the Caspian Sea that only took seven weeks, but they added: "That sea was recently blockaded. Robbers have occupied the Cumin Island. We advise you to take the detour through the western seas, which takes a year and a half." Vasili did not feel like this at all. Once again he allowed his temper to get the better of him, he sailed to the largest landlocked sea in the world, and soon landed on Cumin Island. There he again challenged the robbers to tell him the shortest possible route to Jerusalem. They were rather intimidated, and decided not to overpower the colossus and his helpers straightaway. They decided instead to subject Vasili to a test. If he was able to drain a flagon of wine containing a bucket and a half in one gulp after raising it to his lips with one hand, and if he was able to endure a blow to the head with a club of 10 poed without falling down, they would send a pilot along with him. However Vasili succeeded and endured, all this without difficulty. After the blow with the club he mocked: "Have I been stung by a mosquito?" After a journey of seven weeks with the pilot, the ship reached Mount Tabor. They moored, and climbed the mountain. Halfway to the top Vasili stumbled on a skull. He cried out: "Speak, you desiccated death's head. Are you the head of a scoundrel, a robber, a Tartar or a Christian?" In his conceited way he kicked it right into the clouds. When it fell back to earth, the skull lamented: "Why did you do that, Vasili Buslayevich? I am the head of a Christian crusader, braver than you. Because of the dishonourable way you have treated me, your head will soon fall on this spot and be covered in dust." Vasili jeered at the skull, and climbed to the top of the Tabor with his band of men. He then climbed down again and hastened to Jerusalem. In the cathedral in that city he had a Mass sung for himself and for his old mother, prayed for forgiveness for all his former sins, and gave generous gifts to the priests. Then he went to the Jordan to bathe with his 29 followers. Vasili bathed naked. An old woman saw him and called out: "Why are you bathing naked, Vasili Buslayev? Only our Lord Jesus Christ could do that when he was baptized by John the Baptist. Oh brave band of men, know that you will soon lose your leader." Suddenly filled with fearful premonitions, Vasili led his men back to Mount Tabor so that they could all pray for forgiveness for his mockery of the skull. Where the skull had been, the hero now found a rock 40 vadem long and 20 vadem wide, with the following words hewn into it: "Anyone who has the courage to jump over me will not stand up alive." Once again Vasili felt challenged. He jumped, stumbled and hit his head against the ground. Dying, he sent his band of men back to his mother with the request not to spend any money in his memory. His friends buried him, sailed back to Novgorod, and told Amelfa Timofeyevna of the death of her son. She gave all her possessions away to monasteries so that the priests would pray incessantly for the peace of Vasili's soul. Having lived, Buslay passed away. That one would stoop when he walked. "Hail to you, Vasily Buslayyevich! You'll make the Volkhov River turn sour." Why are you coming home so cheerless and so joyless? Did someone on the street insult you?" "No one on the street insulted me. That one will stoop when he walks. I'd make the Volkhov River turn sour." So that no one in Novgorod will insult you." A chalice measuring a bucket and a half. Will belong to my brave druzhina!" And quickly wrote letters in cursive. "Vasily is calling and inviting you to a feast of honor"
And he shot the arrows around Novgorod. And they went to Vasily's feast of honor. We'll drag away your red gold." He didn't like these words. And he swung his club. Wherever he swung again - a lane would appear. As though bad weather had struck the men down. To Vasily in his wide courtyard. He drank the goblet in one draught. Vasily grabbed his scarlet club. The curls on his reckless head hadn't budged. "Hail to you, Kostya Novotorzhanin! He went into the River Jordan. "Hail to you, Vasily, Buslay's son! Himself bathed in the River Jordan. The honorable widow, Amelfa Timofeyevna." "You were sleeping and saw your own fate in a dream." "I was sleeping, and I saw you in a dream." They set out sailing for their tsardom. "Hail to you, my brave druzhina! Let's pray to the miraculous cross and to God." They set out, the brothers, for the steep mountain. The stone was three elbows in height. Let's jump forward and then jump back. He can jump forward but can't jump back." They jumped forward and jumped back. That's no merit for a bogatyr. In a single coffin, on the right side..."
She was looking through a spyglass. There were no black brows on the ship. For the young Vasily Buslayevich.